Hop flowers are typically used in beer thanks to their antibacterial properties that help prevent spoilage, as well as for their ability to balance the sweetness of malt. They tend to have a bitter flavour, although there are dozens of varieties of hops with different flavours. I've come up with a list of suggestions for ways to use hops and thought I'd share them with you. Some of you might just find hops at your local market, too, and want to give them a try. Or perhaps you've decided to brew as well and have a surplus of hop flowers. They can make beautiful garnishes as well, so it's worth picking up a handful if you see them! 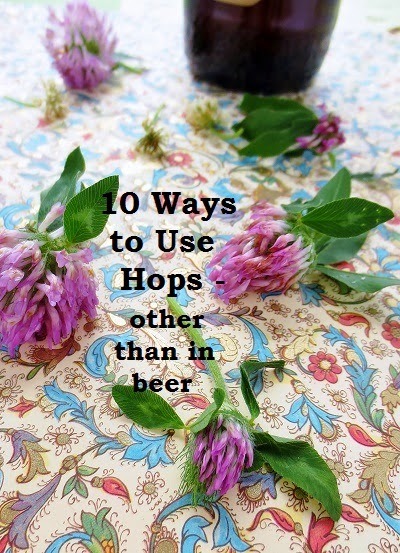 What can you use hops for? Hop flowers can be used as both food, or for non-culinary things, like tea, pillows, soaps, and more, because of their scent. I've listed both below, starting with the culinary uses. Some of these are links to websites with recipes I have not tried, but that look worth checking out. 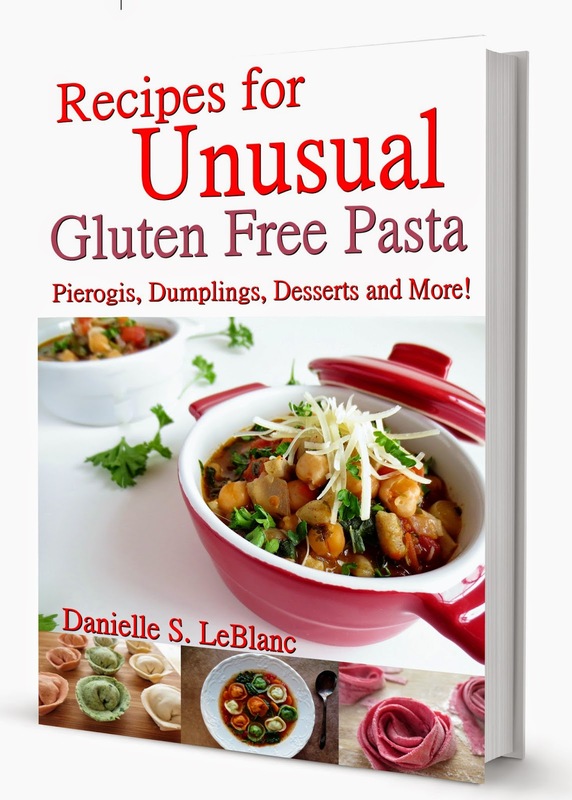 Not all the recipes are gluten free, but I included them to help spark my own imagination, and hopefully yours, also! * And an FYI - hops are generally green, and spiky. 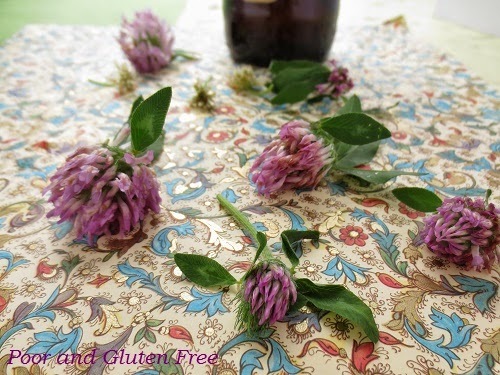 As it turns out, I was given a handful of purple clover mixed in with my hops and which I used for the photos (thanks to an anonymous reader for pointing that out, as I didn't know if they all looked the same or not!). What do hops taste like? I am less familiar with the varieties of hops, and have no idea what kind it was that was given to me at the market, but it's worth looking into more as each variety has a different scent and flavour. They've been described in a variety of ways ranging from "grassy" to "citrus" to "peach or pear" or "piney" and so on and so forth. Rest assured, though, they do range in bitterness. Mine were not terribly bitter, but I wouldn't pop a whole handful in my mouth at once. A light touch is key. Cooked hops are more bitter than raw. In beer making, the length of the cooking time increases the bitterness of beer. The longer the cooking, the more bitter the beer. The bitterness is why, it seems, that some people on various forums don't recommend using hops in baked goods. The bitterness increases with baking time, so hop muffins probably aren't on my agenda any time soon. But who knows, a mild flavoured variety could work well. 1. Hop flowers as salad garnish. I made a salad (like the one shown above) garnished with hop flowers. Mixed lettuce, cashews, roasted baby beets, and hop flowers = simple. I drizzled it with the Sorghum and Citrus Dressing I had made for beet greens. The sweetness of the sorghum syrup balances the bitterness of the hops. 7. For making hops yeast (for those who are allergic to brewer’s yeast). This is apparently an old tradition. and very interesting. 8. Hops tea - hops steeped in hot water is said to be helpful for anxiety and sleeplessness. The *warning here is that the dosages appear to be unclear. Although from what I can gather hops are generally safe for occasional use, I have also seen warnings that they can in some cases increase symptoms, and that pregnant women should avoid them because of hops' estrogen levels. 10. Hops soap. Drop few dried hop flowers into some homemade soap for pretty aromatherapy soaps. So those are some of the suggestions I've found after scouring forums and websites. I'd love to hear from some of you gardeners out there, too! Have you ever used hops?? Since the hops still had flavor left I added more hot water (and another batch another) The flavor dropped still bitter , but thin (like no body if you drank a wine with a flavor that didn't Linger ), but even so a pleasant salty taste quicker to develop. Note I also made another batch but this time I boiled for a long time for tea at least It had a caramelized flavor to it Subtle , but I liked the tea better with just adding water from the water cooler , and steeping. If anyone has questions Email me. I'm sure to experiment more. in each beer in a 24 (30) pack Of Coolers or what ever. Thanks for all that info! Really interesting stuff, and that tip about drying crab apples is great. My in-laws have an enormous tree and every year I make crabapple jelly, but there's still more apples than we know what to do with! Maybe this year we'll try drying them for something.